In 1986, Queen mounted their most ambitious tour yet, a stadium outing for their latest release, A Kind Of Magic. It would prove to be the band’s final tour with their charismatic front man, Freddie Mercury. One of the most memorable stops on the tour — and arguably of the band’s career — came on July 27, 1986, when Queen played Budapest, Hungary. Though there was no money to be made at this gig, it was more important than that. Queen became the first western act to play a stadium show behind the old Iron Curtain, which, for the members of Queen who grew up during the Cold War, was a significant event. To commemorate the occasion, the show was filmed on 35mm, shown in theaters in Europe and eventually released on VHS and laserdisc. It has never gotten a DVD or Blu-ray release, however, until now. The original negatives were scanned at HD quality and a new 5.1 audio mix was created for this new version. 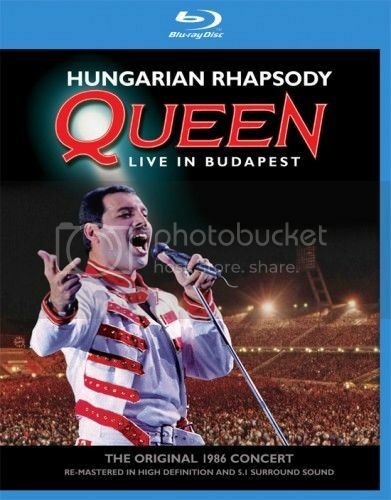 Add in a two-CD set of the complete concert and you have Hungarian Rhapsody – Queen Live In Budapest Deluxe Edition. When the show was first released officially, it was edited to make the show run about 90 minutes. A few songs were cut entirely, while others, such as “Tie Your Mother Down,” were truncated. Sadly, the video rushes for the missing songs no longer exist, so the content is the same as the old release, but in vastly superior audio and video quality. What does remain though are the multitrack audio files, allowing the complete concert to be released as the CD portion of this set for the first time. The results are stunning and, in some cases (arguably) better than their triumphant Wembley concerts that same tour. The show opens with “One Vision” and, from the outset, the band is playing like they have something to prove. Mercury, clad in white pants and a white and red jacket, owns the stage, making 80,000 people feel like a small club, such was his power over an audience. The 5.1 mix is full and powerful and truly worthy of this great performance. Up next is “Tie Your Mother Down.” While the track is shortened on the Blu-ray, it is complete on the CD and the band delivers a rocking performance of this Brian May-penned gem. During the band’s traditional concert medley, Mercury matches his falsetto of 12 years earlier on a strong “In The Lap Of The Gods…Revisited” while finishing the medley with the underrated rocker “Tear It Up” from 1984’s The Works. Several songs feature from the A Kind Of Magic album, including the title track and a powerful “Who Wants To Live Forever.” The latter is made all the more poignant as Mercury died only five years after this performance. Throughout the Blu-ray, the concert cuts away to clips of the band in Budapest, spotlighting the whole band as well as its individual members. May is seen taking a hot air balloon ride during his guitar solo while drummer Roger Taylor is in a go-kart race. “Another One Bites The Dust” is included on the CD, but not the Blu-Ray, which is a shame as it is a loose, funky rendition that would seemingly be a joy to watch. Similarly, “Hello Mary Lou (Goodbye Heart)” and “(You’re So Square) Baby I Don’t Care” from the acoustic set make for fun bonuses on the CD as the band pays tribute to their 1950s heroes. The most heartfelt moment in the show isn’t even a Queen song, however. For this special event, the band decided to learn the Hungarian folk song “Tavaszi Szél Viset Áraszt,” much to the delight of the audience. It took no prodding from Mercury, who was reading the lyrics from a piece of paper, to get the audience to help him out on the song. Quite a moment in quite a show. The Blu-ray is 16x9 High Definition (1.77:1). The original release was 4:3, so it has been cropped, but what was lost at the top and bottom was minimal and we gain image on the left and right. The audio is LPCM Stereo 48/24 and DTS HD High Resolution Audio 96/24. Both the picture and sound on this release are incredible. A short documentary covering the period from Live Aid to the A Kind of Magic Tour is also included. Nowhere did Queen and especially Mercury’ star shine brighter than on the biggest of stages. What bigger than breaking down the walls of an Eastern Bloc country before the fall of Communism? Rock lost one of its greatest performers when Mercury passed, as Hungarian Rhapsody proves in spades.